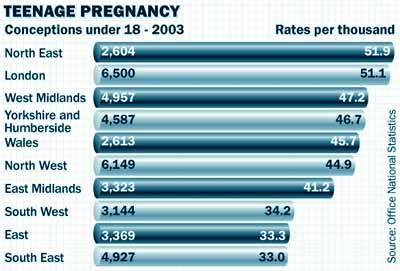 The number of teenage girls getting pregnant has risen, new statistics show. The difference is that the Times take the logical approach of reporting the pregnancy rate, whereas The Daily Mail choose to report using the raw figures, which it is clearly absurd to compare year-on-year. But they have done. So either they’re bottom of the maths class, or they just want to scaremonger. You decide. Abortions are at an all-time high, reaching 18.6 per 1,000 women in March last year. The number aged 30-34 having abortions doubled between 1976 and 2003, to 14,600. The total number of all ages having abortions in 2003 was 190,700. I don’t have a problem with this, but I’m fairly sure someone will have. And to think, the Daily Mail wouldn’t have needed to fiddle the figures if it had just gotten its knickers in a twist about this. This 385th post was filed under: News and Comment, Politics. Comment posted at 23:12 on 25th June 2005. Flicking back through some posts, I realise that I’ve used the word ‘gotten’ here. I think I was possibly ill, or something, when I wrote that, because it’s certainly not the kind of word I’d usually use, living as I do on the East side of the pond. Just thinking that I wrote that makes me feel dirty. Get the Americanism off me! Comment posted at 17:43 on 24th May 2006. Comment posted at 17:48 on 24th May 2006. I wish you the very best of luck with continuing your education. You might also be interested in the story here, about a girl who gave birth in the middle of her GCSEs, and yet still managed to get twelve – seven with ‘A’ grades. Comment posted at 18:17 on 11th May 2008.